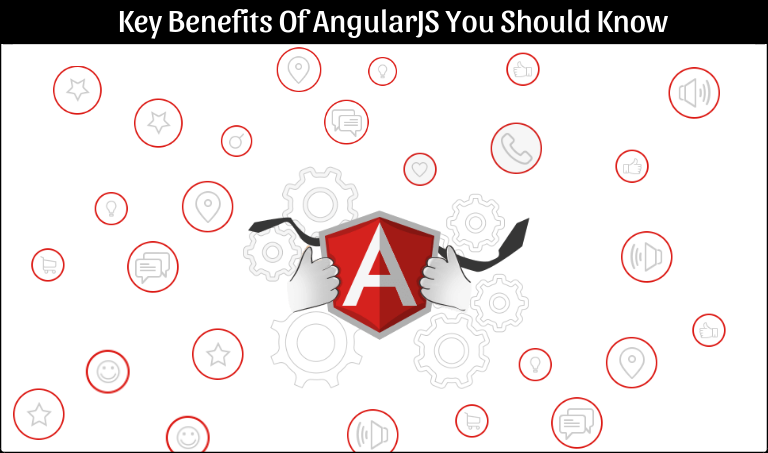 First, just to brush you up on what is AngularJS and then we shall move on to the benefits of AngularJS. AngularJS is an open source framework maintained by Google. It is used to address the challenges faced by developers while developing and testing code. It was originally developed in 2009 by Misko Hevery and Adam Abrons. AnjularJS lets you to use HTML as your template language and also to extend HTML’s syntax to express your application components. Due to its benefits, and features, AngularJS is the best front-end technology for web app development. Thirdly, let us look into the key benefits of AnjularJS. AngulaJS has been developed and maintained by Google engineers. This means you can learn from a huge community. These engineers are capable of solving any of your problems. And clients will get what they want. With AngularJS’s simple architecture you can easily enhance its features to any extent that the client requires. It is easily pliable when it comes to managing heavy web applications that have a lot of components as well as complex requirements. Large applications would contain a bulk of components. With AngularJS you can manage them easily despite a new programmer joining the project in the middle of the process. You can easily locate and develop the code without any difficulty. AngularJS utilizes HTML to define apps UI. With HTML, the app development is simplified. You can simply characterize the necessities and let AngularJS do alternate occupations of an interface. Derived from HTML, you won’t require much time to code an entire application. With AngularJS you can easily and quickly create new web apps. With a few features added to the HTML code, a simple app can be built in less time. Instead of just writing codes you can focus more on the efficiency of the application. You can use the same chunk of code written before. By this, you can save time. Dependency Injection (DI) is one of the most important features of AngularJS. You need not write tedious code for the application. AngularJS has a built-in dependency injection subsystem that eases the process of unit testing. For making it more simpler, AngularJS recognizes your requirements and offers you the services in no time. While designing apps you can avoid HTML/CSS margin and can add markup without actually breaking the application. You just have to move elements around the corresponding code. Two-way dating binding: Two-way dating is an attractive concept. AngularJS provides the projection of models to the application view and it needs little effort from you. Increased flexibility: There are filters present in AngularJS. The filters in its application help in achieving more flexibility in the app by sorting the data before it reaches the view. Context-aware pubsub system: This functionality is used in AngularJS and is actually context aware of decoupling communication. Provides the capability to create a Single Page Application in a clean and maintainable way. It provides data binding capability to HTML. This gives the user a rich and responsive experience. AngularJS uses dependency injection and makes use of separation of concerns. With AngularJS, you can achieve more functionality with short code. The above-mentioned points are the uses of AngularJS. If you want to learn more, most of the prime cities in India offer courses in leading IT courses and AngularJS is one among them. If you are especially, put up in or around Chennai, you can as well learn AngularJS Course in Chennai from reputed institutions. Learning AngularJS systematically will fetch you a career in AngularJS in leading IT companies and also in MNCs.